“Play the game for more than you can afford to lose. Sunshine bathed Learmonth as 22 riders tried to warm up in the windy and very cold conditions. 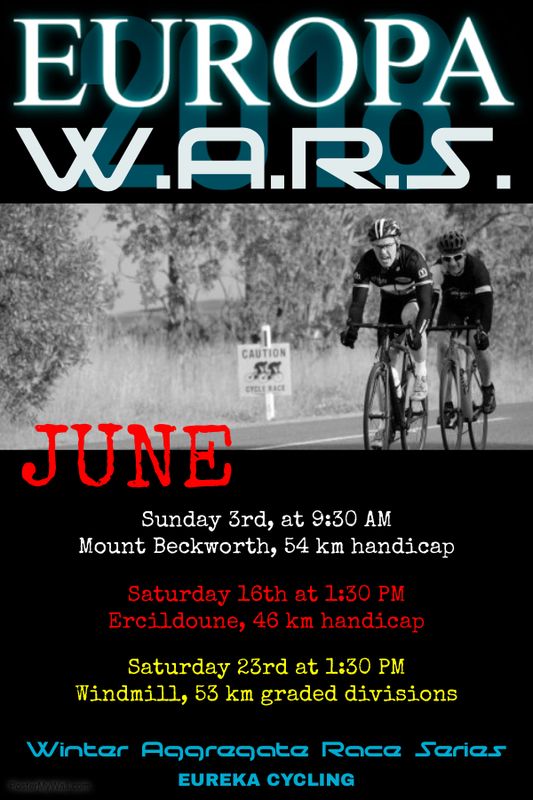 On the menu was graded division racing around the 45 kilometre Mount Ercildoune circuit (formerly known as “Mount Misery reverse”). Four healthy sized divisions rode off under the watchful eye of stand in Referee – Terry Collie. Once again Bill and Lois Goldfinch have ventured off in search of warmer climes. Good luck to them, maybe they might even come across our Club President – John Faulkner – who has headed north for the winter. Back to the racing and Michael Lynch and Graeme Parker were both given head starts in their Division 4 race. Roger McMillan, Kevin Lee headed off some minute later with…well we think it was Jacqui Dawson hiding multiple layers of clothing. At least someone was smart! Michael made it halfway before the wind took its toll. Graeme powered on, in a game of “catch me if you can”. The chasing trio shared the workload and battled the wind together. They eventually caught Parker along the Langi Kal Kal Road, just a few kilometres short of Addington. Much joy for the racers as they turned uphill at Addington with the very strong tailwind. Turning onto the home straight they continued working as a team against the wind. As they neared the line it wasn’t so much a sprint for the finish as a normal rotation of riders. Nonetheless, McMillan took the honours in a great team effort. 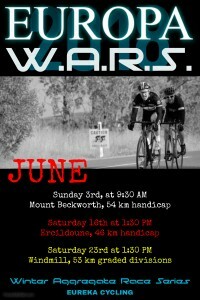 You will never find a more wretched hive of lycra and villainy as the Division 3 race. Players, connivers, manipulators and charlatans, one and all. The backbone of our club and very much in the vein of Ocean’s 11…let’s call them Jone’s 5 because Ralph (aka James Gretton) was at the start line to direct the lads. Off they went on their little closed boys club for another adventure on their velocipedes. James Knipe assumed the bus driver role and drove the bunch onwards where others might have faltered. Actually the others wanted to keep Jim in sight because, well he chose his own adventure on this circuit last time out. Dan Whelan, Bob Morley, Mark O’Callaghan, Steve Linane and Pete Livitsanis (who somehow can ride the wind brilliantly for someone of his stature) made up the gang. Morley and Livitsanis made an early break – with Knipe – after the chicane and it looked like it might stick. But these shysters are smart enough not to blow themselves apart in such winds – so they eased up and let the bunch regroup. Ride together and decide it all in a sprint! We could write paragraphs about the shadow boxing, the attacks and the foils during this scrap…however the reality of the day was that Knipe spent 80% of the time on the front. Whelan did what he does best – push bloomin’ hard and open gaps to soften the others up. Fifi was strong again after his recent back struggles – it’s an age thing! O’Callaghan kept reminding them “I’m gone” – whilst following wheels with ease. Muncher was calling the on-road shots and thinking “My team works better than Marcel Kittel’s”. Linane was lost early to the group though and set about time trialling to the finish alone, happily cheering on other Divisions as they came through. Into the home straight and Knipe kept up his efforts on the front. Whelan was poised to hit out early. Livitsanis was counting down the metres to his launch spot. O’Callaghan was congratulating himself on selling such a convincing ruse. But, Morley surprised them all and went early. Division 2 fielded the smallest bunch of the day. 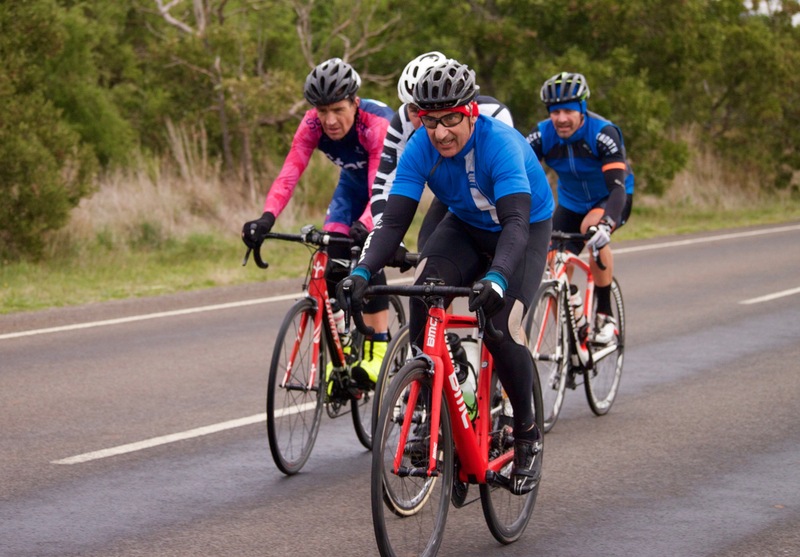 Former Club Champion – Andrew Rushton led the group off with Peter Canny, Greg Nunn and Jeremy Humber in tow. Joining them for his first time out in quite a while was Peter Gunston. Nunn – soft pedal and smash ‘em at the end. Humber – hang on and launch early in the sprint. Canny – ride them off my wheel before they can sprint. Gunston – hang on and bury myself at the end. 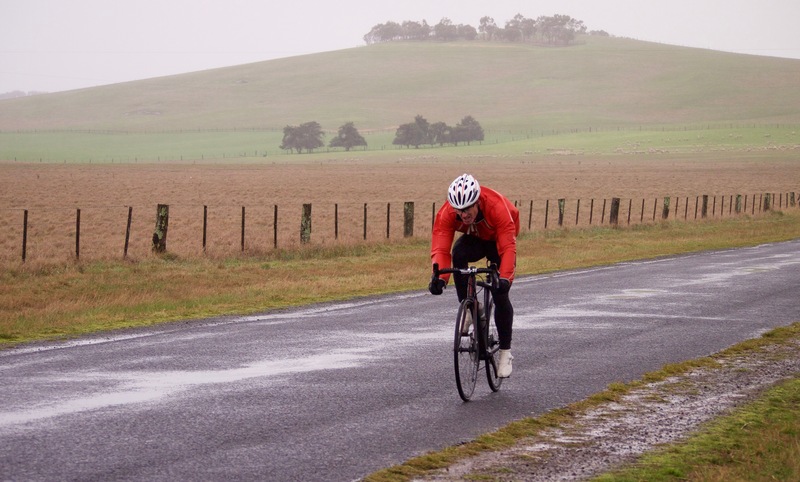 Rushton – ride hard and drop the sprinters. Now and then one of the riders would put in a vicious turn…only to be disappointed that the others were still there on his wheel. Through Addington and Rushton ignited the race. His massive effort up the climb – was matched by the others and the outcome was Rushton succumbing to his own plan. Home straight and the remaining riders eyed each other off. Canny went early and packed too much punch as one by one the others faltered in the race to the flag. Another Sunday, another Division 1 smashfest. The only question is when will the Club Champion – Tim Canny – swing the hammer. Dave Olgivie and Matt Bowman both returned to the ranks today after extended leaves of absence. Jason Birch and Tony Mirabella lined up again. Also, the much awaited return of Dean Wells to the Division 1 ranks was celebrated. It would prove to be a very short celebration! Early in the race and the combination of tailwind and everyone trying to warm up saw the race go out fast. On the downward run to the chicane Wells couldn’t match the pace and he was off the back. Mirabella (completely out of sorts) was also off the pace. Ahead and the remaining four were swapping turns. In true Team Time Trial mode, they battled the wind together and shared the workload. Still, it would only be a matter of time before Canny tired of the company. 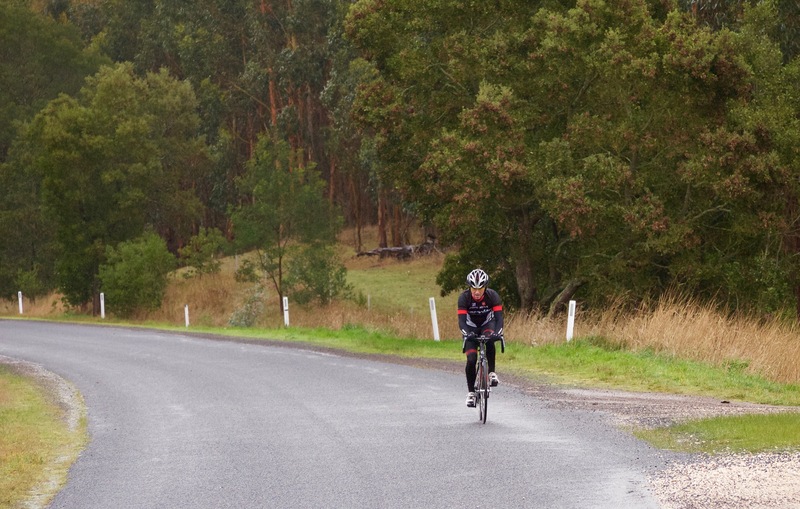 That time came after the early climb in Beaufort-Waubra Road. Over the first obstacle and Canny simply rode away from the others. Oh, they fought to hold his wheel…but the inevitable loss of contact left three watching the Champ ride off alone. Bowman eventually fell off the pace of the chase, leaving Olgivie and Birch alone in their forlorn pursuit of Canny. Through Addington and the the Division 1 riders launched up the climb. Canny pulled further ahead as he soloed towards another win. Home straight and the interest lay in who could claim second place as Canny sped away to win by minutes. The chasing pair settled down for the sprint with Birch claiming the red ribbon. It was a bleak day. The wind roared down the finishing straight, as the riders milled before the referee at “the big tree”. 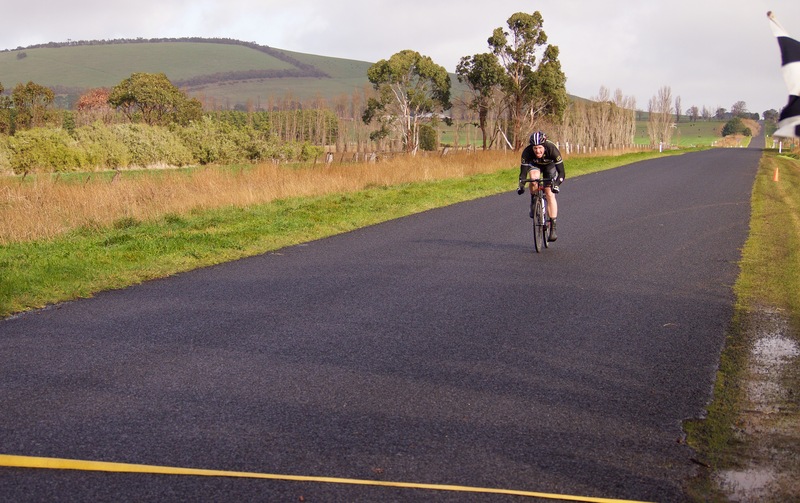 The revised start line provided some relief for the small field – it meant there was one less kilometre of headwind to ride into. The wind brought misty rain and cold down upon the riders. Staring into those sharp teeth, it was hard to imagine they would ever make the turnaround point. Oh how glorious that tailwind would be on the return leg. Please, let there be a tailwind! Limit rode off at 14 minutes. Terry Collie, Kevin Lee and Roger McMillan were joined by Peter Livitsanis. In an act of kindness, the Handicapper had moved Livitsanis out a bunch. With precious little time in the saddle recently, Livi was going to need every advantage just to make it to the finish. In the conditions, Limit would certainly have to earn their stripes today! The 10 minute group saw Brian Ure return to racing. Joined by Bob Morley and Danny Whelan, the bunch had one aim in mind – don’t get caught before the turnaround! Whilst they might not rotate as smoothly as the bunches behind, strength in numbers would be the key to any success. They protected each other as best they could. At 5 minutes Grant Dawson, Peter Canny and Jeremy Humber set off in pursuit of the out-markers. The Second Scratch bunch were strong riders, one and all. Today they needed everyone to measure their efforts early and not overdo it. Straight into formation, they slipstreamed when they could and drove hard when it was their turn. Scratch was a three man affair as Tim Canny lined up with Craig Lee and Greg Ley. Comparing the handicap marks of the previous week, one would surmise that some members of this bunch would go deep into the hurt locker. The previous Sunday seemed like a lifetime ago. Last week, there was but a breath of breeze. Last week, there was sunshine. Last week, Ley was victorious. Three, two, one, go…and they did. Up ahead and Limit was battling its way forward. Four had dared to venture over the parapet, but their number was now just three. Barely one thousand metres down the road they had lost Collie. He had struggled to find forward momentum into the fierce wind and was distanced before the turn onto Edmonston Road. A similar tale had befallen Scratch. Ley found himself out of sorts and with no rhythm. Forlornly he had watched his bunch disappear into the mist. The race was on the downhill section away from Weatherboard. The easy ride did not fool anyone! 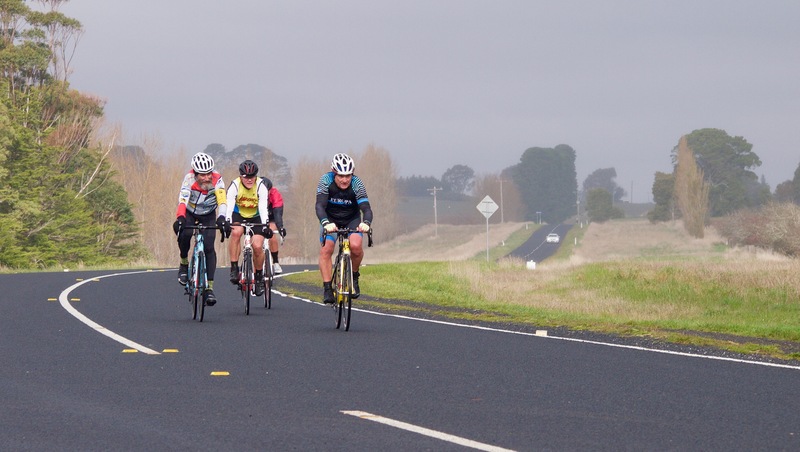 They all knew that the headwind would be waiting for them as they climbed out of Addington. It was and it pounded them. 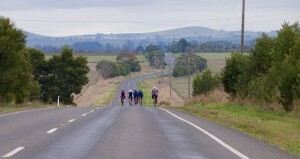 The long straight road allowed the chasing groups to finally catch a glimpse of the riders ahead. Through the swirling mist the tail lights could be seen. Like beacons, those lights gave each rider hope and something to aim for. The bunches continued to split. Here a rider, there a rider. One at a time they succumbed to the wind and rain. Craig Lee had lost contact with Canny. One metre off the wheel had quickly become five, then ten. The cord broke. 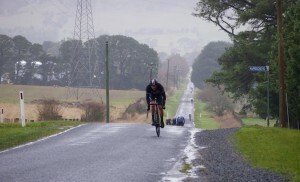 Head down and time trial. Maybe catch someone ahead, maybe. Club Champion Tim Canny, powered forward. Each pedal stroke bringing him closer to the lights ahead. Approaching Waubra there was more climbing. Hills are opportunity, hills are friend. Limit had blown apart. Past Waubra and Livitsanis found himself out in front. He had no-one to share the work with. No one to shelter behind. Morley, Ure and Whelan had picked up McMillan for the ride. Four riders gave them an advantage over everyone else on the road. Kevin Lee was just a few hundred metres ahead. It was only a matter of time, then they would be five strong. Humber, Dawson and Peter Canny were fluent in their chase. They were slowly closing on the lights ahead. Behind them the misty rain made it harder to see what was coming. Glory to one and all. That sweet tailwind! There is a long hill to climb, but now the wind was their friend. Livitsanis struck out on the return leg. The chasers were not far behind. He found his pace and held them off through the early steeper climbs. Morley, Ure and Whelan were just three again. Soon they would have the race lead. Dawson, Canny and Humber were climbing fast. 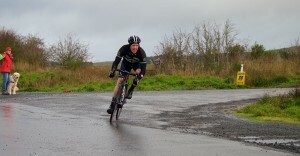 Tim Canny was climbing faster and he swept past them in a flash. Dawson and Humber struggled to lift their effort higher. The elder Canny held his son’s wheel for a few hundred metres. Then he too was cast adrift. There is just one bunch on the road. Morley, Ure, Whelan and Livitsanis. Everyone else is riding solo. They each push forward, alone. The leaders raced towards Addington. Canny steadily closed the gap. Carefully through the sharp right turn. Canny was within striking distance. Climbing back towards Weatherboard and here comes the Champ. Canny hits hard before the steep section. Ure momentarily grabs the wheel and pulls away from his mates. They rally and start swapping turns. Ure comes back to them. Then the downhill section to Weatherboard. The wind is their friend. Canny leads by a long margin through the final turn. Morley, Ure, Whelan and Livitsanis follow. Two and a half kilometres remain. The tailwind is strong. So strong that each rider experiences something unique…pushing close to 70 kilometres per hour, they simply cannot pedal any faster! The smooth road, the wind, the speed and their own exhaustion. Ahead and Canny takes another amazing victory in his stride. Minutes later and Ure is leading Morley out. Morley launches for second. Livitsanis and Whelan trail them in. The rest are still out there. 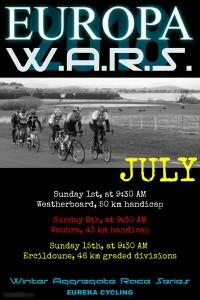 Brilliant sunshine greeted the twenty two riders who signed on for round 4 of the EUROPA W.A.R.S. A new start line at the top of the climb in Hendersons Road was warmly received and for once confusion did not reign. 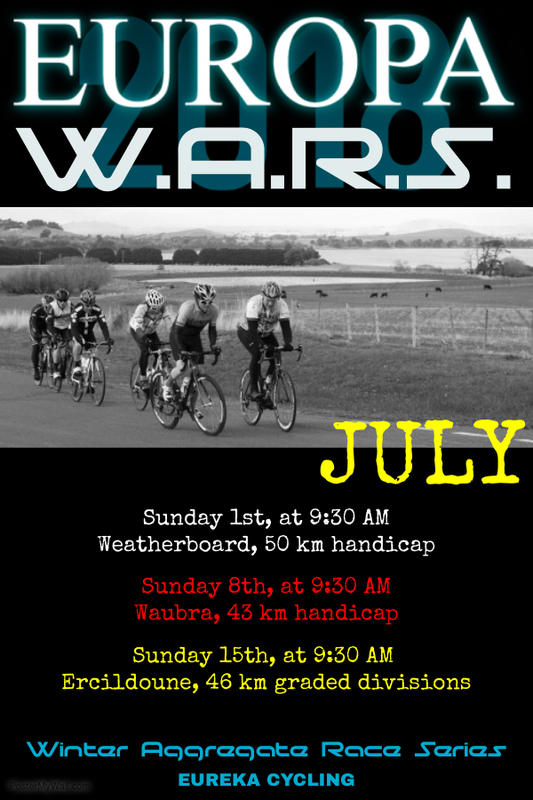 Five laps of Weatherboard – simple. 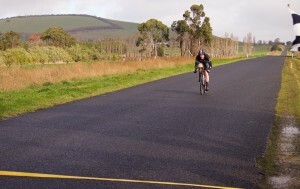 Five Limit riders (14 minutes) rolled away in the near perfect conditions. No time to waste on this circuit though. You’re either climbing or descending and there are no “easy” sections. Bob Morley led the charge out with Brian Lee, Steve Linane, Roger McMillan and Phil McLennan. So what did you do on Saturday? Coffee and no bike ride? Indoor trainer maybe? Well, Phil McLennan ran to the top of Mount Buninyong, then ran back down…dedication! The 9 minute group consisted of James Knipe, Jeremy Humber, Ash Burke and James Gretton. The smallest bunch of the day (we don’t count the sole Scratch rider – Tim Canny – as a bunch) aimed to limit their losses and hitch a ride towards the end. With the lightest of breezes they would struggle to catch Limit, with just four riders they would struggle to stay clear of the chasers. Today’s chopping block? At 4 minutes, Greg Ley led out an interesting mix of reward and respite – Jim Crumpler, Peter Canny, Dean Wells, Grant Dawson and Jason Hendry. Surely enough firepower here to hold off the chasers with the Handicapper’s gift, but could the talent work together? Second Scratch rode off at 1 minute and included Tony Mirabella, Craig Lee, Brendan Schiemer, Jason Birch, Rob Ellis and Peter Kiel. Their challenge was to hold the sole Scratch rider – you know who – at bay, whilst taking time out of the four minute bunch. Out on course and the 4 minute bunch was taking huge chunks of time from the out-markers. It was coming at a cost. Crumpler (in recovery from illness) was suffering and Hendry was grimly hanging on. Canny, Dawson, Ley and Wells kept the engine at close to full throttle. Second Scratch held Canny off for about 15 kilometres. During that time they took mere seconds out of the 4 minute group. Once Canny joined them, the race got harder and the time gap started to fall. Limit were working well under the guidance of Morley and they maintained much of their gap over the 9 minute group through the first two laps. Knipe and company pushed hard, but they could almost feel the 4 minute group closing in as they neared the end of lap number two. Crumpler pulled out from the 4 minute group at the twenty kilometre mark, which was around about the same time that McMillan lost contact with Limit. 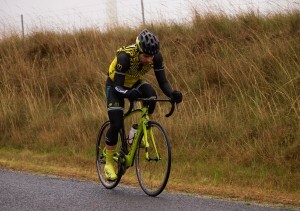 Gretton couldn’t hang onto the pack when the 4 minute group caught the 9 minute bunch on the third lap. The 4 minute group (now with added passengers) kept rolling turns. They could see the leaders ahead, yet they couldn’t see Scratch. For their part, Scratch had halved the gap to the 4 minute group and looked on track to make the catch, however it had come at cost. Schiemer struggled with low race fitness and dropped off the Scratch bunch nearing the end of lap four. Onto the final lap and Limit started to struggle. They could see the pack closing and Linane dropped off the back. The fluent turns of the early laps was replaced with choppy efforts as Lee, McLennan and Morley sensed the inevitable. Caught halfway along Avenue Road, they showed their tickets and jumped on board the train. Ley wasn’t keen on towing too many to the finish. He surged up the Avenue climb, however the group rejoined. The next chance to ditch the passengers would be out of the Avenue. Out of the corner and Ley went again. Morley left in No Mans land and the rest all looking for wheels. The rush eventually came and Ley was brought back – bunch still intact – however Scratch had just exited the Avenue and had their sights planted firmly on the leaders. Over Weatherboard for the final time and Ley tried his luck again. Peter Canny followed and so did Wells, but they pack came back…again. Down through the chicane and Hendry found himself on the front with no-one really willing to help out. There wasn’t too much time to spend playing games because Scratch was closing rapidly. Through the final corner and Wells put the race into the gutter. The wind was at their backs as they lined out on the road edge. Over the bridge and the last ascent of the Hendersons Road hill. Morley was in second wheel and ready to pounce, when Ley hit hard down the inside. Humber was on his wheel. Burke and Canny quickly jumped out of the pack to follow. Hendry followed late, but with more speed than Canny and Burke, he quickly passed them and started bearing down on the two juking it out ahead. Ley was leading. Humber was closing. Hendry was closing faster. At the line Ley takes the prize with a bike length over Humber and two bike lengths to Hendry. Canny and Wells follow, the rest of the train has disintegrated. Just 15 seconds behind and Scratch are charging towards the line. The sprint is for pride only. Tim Canny has Fastest Time already sown up. 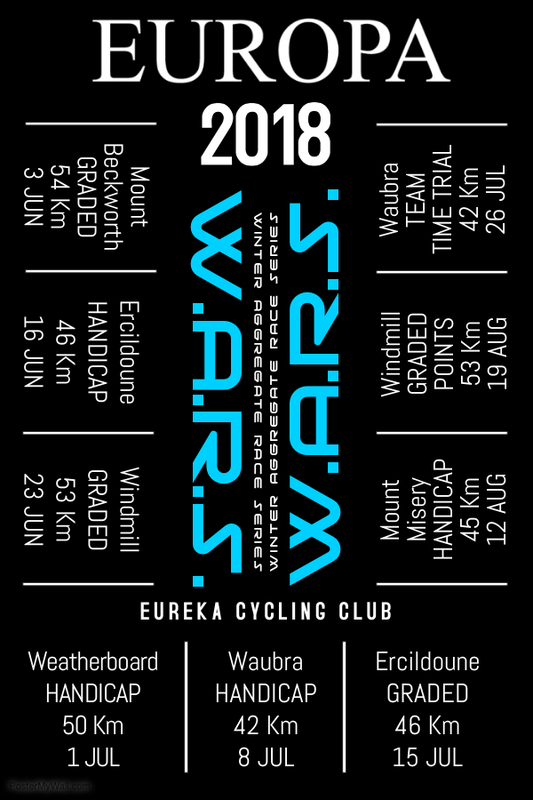 Saturday 23rd June will long be etched in the memories of Eureka members. Whilst a small determined brigade stayed at home to battle – an elite squad ventured to the Eastern front and stamped their presence in a dominating fashion. We could continue with the superlatives about the Eastern front, however this report is about the home guard. Those few who remained true to the cause and contested a most interesting event. W.A.R.S. take on their own character. They evolve as necessary. The combatants deal with what is presented. 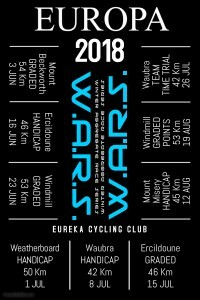 The rescheduling of the Eastern Vets Open to the same date, saw Eureka Cycling change their race to a graded division event. Then, as so often happens, the goals changed again. Few riders arrived at Learmonth for the Saturday afternoon races. Subsequently, the event was reverted to a handicap. 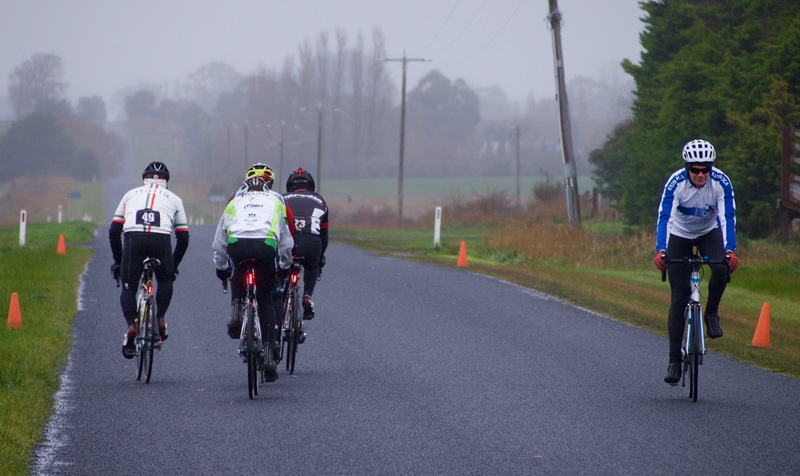 Eleven riders warmed up on what could best be described as a “bleak day”. It was cold. Light showers drifted across the Windmill circuit, yet the breeze was barely there. A suggestion to further change the event into a two lap (35 km) affair was refused. The riders wanted to race. And, race they would – over the full three laps! Eleven riders, three bunches…light showers would make the race less than pleasurable. The eight minute group (Limit), rolled off with the resignation that they would be caught mid-race. Kevin Lee struggled from the start. Only a late decision saw Kevin even sign on. His day would be a struggle and just two laps before retiring. The remainder powered on. Just three against the rest. 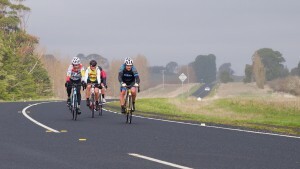 Dan Whelan, Bob Morley and Steve Linane worked well together from early in the race, yet they suspected to be rolled up early. At four minutes a most unique group set off. This bunch says all that is good about veterans racing. The retired teacher, the doctor and the fireman. Let’s not forget that the retired teacher is in his seventies! Scratch presented yet another mix of interesting riders. 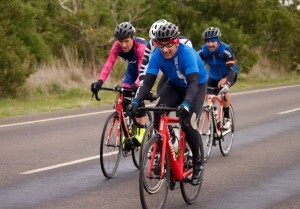 The cynics among us would suggest it was a lead out train for Tony Mirabella. Rob Ellis, Tavis Baker and Stuart Brien were the ensemble… then again, those other guys certainly have more than just one trick (hard riding) up their sleeves! The first lap saw each bunch seemingly taking a cautious line around the circuit. Sure there were wet sections, however each bunch seemed to be on the same wavelength – let’s just gradually increase our pace. Except for Lee dropping off the Limit group, the other two bunches were fully intact. Through to halfway and the race had started to compress. Scratch was closing on the four minute group, but Limit still held a significant share of their handicap. Coming through for the bell lap and Limit was just two riders – Whelan and Morley. Linane trailed them through a few minutes later and not far behind him came the combined Scratch and four minute bunch. The Limit riders still held a 3 minute advantage though. This could be the biggest steal ever! 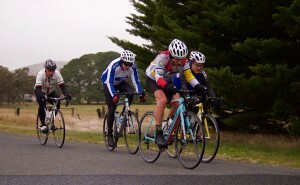 The combined Scratch bunch had ridden the second Windmill lap almost 90 seconds faster than the first. Turning towards the quarry they ramped up the pace again. Mirabella pushed hard and swapped turns with Baker. The rest bit handlebars just to stay in touch. They swept up Linane and could see the leaders – Morley and Whelan – ahead. Over “Quarry Hill” and the bunch was still together. They had also halved the distance to the race lead. Towards Addington Road and the enlarged Scratch bunch was recovering. The leaders were just ahead and now was the time to decide when to make the catch. They gradually closed the distance and finally rolled up the leaders early in Donovan’s Road – just four kilometres remaining. Ellis assumed the lead and went to the gutter. The breeze was barely present, so the tactic did not blow the field apart. Into the final two kilometres and Ellis ramped the pace up as high as he could. The ten riders were almost in single file, however Humber was caught out wide. With five hundred metres remaining, Humber made the decision to go! At the front, Ellis was waiting for the attacks. Baker was close behind and Veal was ready to jump onto any passing wheels. Humber came down the middle of the road and caught everyone by surprise. So early! Even more surprising was Linane coming through at the same time. Tactics were out the window. Scripts were cast aside. No one knew what to do! Baker gave chase and towed Veal along. Mirabella hooked out and was caught in two minds as when to sprint. Back midfield, Brien was giving up any hope when the riders divided like Moses and the Red Sea. Could it be? May as well have a go! 100 metres remaining and the race could be won by anyone. 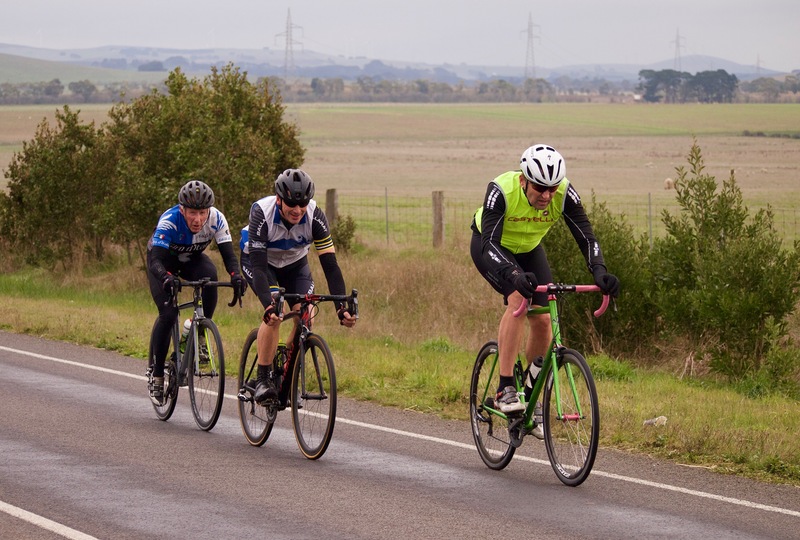 Veal swept to the lead out wide – thanks to the perfect lead out from Baker – then Brien came down the centre of the road and gapped them all for the win.